DENVER, Jan. 4, 2018 /PRNewswire/ -- Every January, 45 percent of all Americans – or 135 million people – make New Year's resolutions. Research shows approximately 80 percent of those resolutions will fail by February. 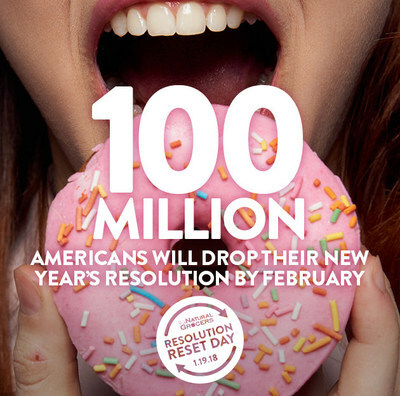 Natural Grocers, America's Health Education ExpertSM, is resolving to help Americans with their 2018 health and wellness goals by creating the first ever Resolution Reset Day at Natural Grocers in Las Vegas on Friday, Jan. 19. The Natural Grocers store in Las Vegas is located at 6305 Simmons St.
"Without the right guidance, support and access to affordable, good-for-you foods, it can be difficult to achieve your health and weight goals," said Shannon Rhett, Natural Grocers Nutritional Health Coach in Las Vegas. "Instead of dropping your resolution this year, Natural Grocers is here to help you reset it and stick to it." Natural Grocers is uniquely positioned and qualified to help Americans reach the full potential of their health and wellness resolutions. Natural Grocers offers nutritional health coaching year-round, free of charge, to all customers. All stores have a Nutritional Health Coach (NHC) position. NHCs are highly trained health education experts and serve as your go-to resource for all things related to nutrition and health. They also offer free nutrition classes, recipe demonstrations and personalized, one-on-one sessions. Natural Grocers' Director of Nutrition Education, Karen Falbo, makes recommendations for those with resolutions to lose weight and eat healthier in 2018 in this downloadable infographic. On Jan.19, all Natural Grocers customers are invited to stock up on items needed to reset their resolutions the right way, including 100-percent organic produce, 100-percent free-range eggs, 100-percent pasture–based and non-GMO dairy, antibiotic and hormone free naturally- raised meats and the highest quality dietary supplements and body care products. 12 to 2 p.m. – Customers at all 142 Natural Grocers stores can check out the "Hack Your Coffee Bar" to unlock coffee's hidden health potential, including MCT Oil and Collagen to help kick-start your day and your brainpower. Free Natural Grocers reusable shopping bag, with purchase. Hot Deals 3-day sale Jan. 18 to 20. $5 off $35 coupon to use on a Feb. 3 purchase. To learn more about the nutrition classes offered or to schedule a one-on-one session in your area, use our store locator to find the nearest store. With a solid platform as America's Health Education Expert, Natural Grocers unveiled these Top 10 Nutrition Trends in 2018. Natural Grocers by Vitamin Cottage, Inc. (NYSE: NGVC; NaturalGrocers.com) is a rapidly expanding specialty retailer of organic and natural groceries, body care and dietary supplements. The company offers a flexible, neighborhood-store format, affordable prices and free, science-based nutrition education programs to help customers make informed health and nutrition choices. Founded in Colorado in 1955, Natural Grocers has more than 3,000 employees and operates 142 stores in 19 states.